Verus LLC has been selected by The National Law Journal readers as one of the top firms in their “Claims Administrator” category. 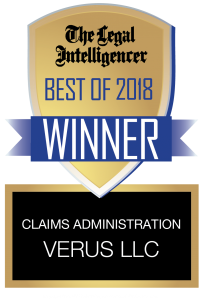 Verus LLC is pleased to announce that the readers of The National Law Journal have voted Verus to be among the top Claims Administrators in their annual “Best of The Legal Intelligencer Reader Rankings” survey. Readers were asked to cast votes on service providers covering diverse aspects of the practice of law. Verus serves clients by providing end-to-end support services by knowledgeable experts backed by state-of-the art technology. Verus has achieved solid success, first by hiring talented people who share a common vision and values, and second by equipping them with purpose-built technology that empowers them to do more. This combination has allowed Verus to evolve into a full litigation support service provider able to assist clients in practically every aspect of managing complex litigation. Verus Introduces Lucid, the new portal for our case management and medical review services.